The transmission attenuation of HIREC was measured for high frequency radio signals. HIREC has a low transmission attenuation of 0.1 dB or less in Ka band to V band (30 GHz -70GHz). This indicates that HIREC is a suitable coating material for radar and convenience-radio applications. A thin membrane with the same structure as an actual HIREC painting was prepared. - Relative permittivity: 4.47, Dielectric loss tangent(tanδ): 0.0139 at 30 GHz, 55 R.H.
- Measurement conditions: 27°C, 55 R.H. In Ka band to V band (30 GHz -70GHz) HIREC shows a low transmission attenuation of 0.1 dB or less. 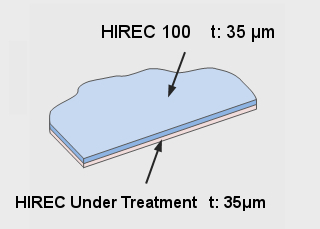 HIREC is a super-water repellent material suitable for radar and radio application.